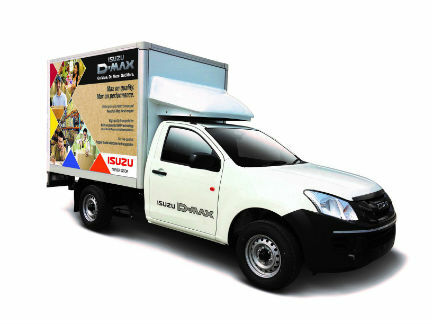 New Delhi: Isuzu Motors India Private Limited (IMI) is showcasing the new ISUZU D-MAX Reefer and Dry Box applications at the India Cold Chain Show, being held at the Bombay Exhibition Centre in Mumbai, between 12th-14th December, 2017. The new D-MAX Regular Cab (cab-chassis variant), powered by a 78 hp 4 cylinder, 2.5 ltr Common Rail Turbo Intercooled Diesel Engine, offers enhanced efficiency and promises superior quality of transportation for cold-chain operators. ISUZU’s world renowned D-MAX pick-ups have been gaining phenomenal traction in India and has been addressing the key requirements of LCV customers in terms of performance, quality and reliability, thus maximizing their business returns. Designed to meet the growing demand for modern and efficient cold-chain transportation in India, the new D-MAX pick-up promises higher ‘value for money’ to the operators. The new Reefer body (Fruehauf Mahajak) on the D-MAX is made using the ‘sandwich’ process with light-weight aluminum and hi-quality extruded polystyrene (XPS) material, ensuring better thermal stability and higher payload. The ISUZU D-MAX Regular Cab, a single cabin pickup, is a tough, powerful and reliable workhorse that is globally known for its performance and long life durability. The Regular Cab is available in both flat deck and cab-chassis variant. The cab-chassis variant is an ideal vehicle to build reefer containers for cold-chain transportation, enabling efficient movement of dairy products, perishable goods, pharma products etc. The cab-chassis variant can also be customized for special purpose applications in the logistics and allied business requirements.